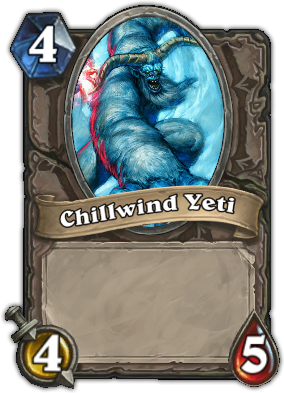 Druid Digest: Why is Chillwind Yeti a Good Hearthstone Card? Bumping minions into one another to thin the opposition's ranks is commonly referred to as trading. Basically, you wipe out your own minion to wipe out one or more of your opponents minions. Obviously, the wisdom of any trade is situation specific, but generally speaking a trade is good where the mana cost of the enemy minions you destroy is greater than the mana cost of the minion you lose in the exchange. With this in mind, it starts to become clearer why Chillwind Yeti is a great card. At 4/5, the Yeti can only be killed in single combat by a lone lower cost minion: the 3 cost King Mukla. If you lose your Yeti to this beast though, you have a pair of +1/1 Bananas buff cards in hand to console you. Also, Muckla's legendary status means you won't have to worry about him more than once each match. Other than the big monkey, your Chillwind can generally be counted on to gobble up at least two lower cost minions in a trading scenario. In terms of even trades, only a handful of 4 mana cost minions are capable of directly trading with the Chillwind. That is to say, very few other 4 drop minions have the attack out of the gate needed to stomp out the Yeti's health in a single swing. First, there is the 5/4 Ancient Brewmaster. However, the Brewmaster comes with a potential drawback in that he pulls one of your other minions off the board. This drawback can be an advantage though when used to replay cards with Battlecry effects, to erase silences, to kick up combos, or to reset a minion's health. The Yeti is NEVER a bad card to put on the board. The same thing cannot be said of the Brewmaster. Leeroy Jenkins can also trade with Chillwind Yeti, but he summons a pair of 1/1 minions for your opponent when you put him on the board. Also, as a legendary, an unaided Leeroy will never be responsible for more than a single Yeti death. The Priest exclusive Light Spawn can also trade favorably with a Chillwind, but only if avoids all damage from any other sources. Similarly, Pit Lord can trade with a Yeti, but its Battlecry is brutal. Shockingly, that is it for the 4 cost cards with the attack needed to knock out the Yeti. Chillwind also trades up really well, eating higher cost cards like Azure Drake, Gadgetzan Auctioneer, or Priestess of Elune. All the foregoing adds up to mean that in a minion trading situation, Chillwind Yeti will nearly always be a solid mana investment. Another trait which gives Chillwind Yeti added value is that his 5 health makes him too sturdy to fall victim to most board wipes. Ping cards like Arcane Explosion or Whirlwind barely dent him. Cleave, Explosive Trap, Lightning Storm, Consecration, Hellfire, Swipe, Holy Nova, and Multi-Shot also cannot put him down. Even the highly expensive Flamestrike is unable to remove a Chillwind Yeti from the board on its own. This creates a situation where, more often than not, the Chillwind will be left behind after one of these wipes. This means your opponent will need to burn another card, a weapon swing, or one of his own minions if he wants his sweeper cards to clear your board. Another great value adding feature of the Chillwind Yeti is that his 5 health lets him fly over most cheap single target removal and damage spells. He is simply to beefy to fall to an Eviscerate, Hammer of Wrath, Lightning Bolt, Shadow Bolt, Wrath, or Heroic Strike. Sure, he can fall victim to a Polymorph, Assassinate, or Hex, but you want your opponent to burn those potent removals on a 4 drop Yeti rather than your higher cost, game-changing cards. Similarly, a Mage can burn him with Fireball, but better that spell singe the Chillwind's fur than you. Lastly, your opponent can swing weapons at the Yeti, but will take 4 damage for the pleasure of doing so. The last nice bonus of the Chillwind Yeti is he hits that attack value sweet spot of 4 where he cannot be targeted by either Shadow Word: Pain or Shadow Word: Death. This makes him a difficult card for Priest's to handle and further adds to the Yeti's acclaim. Chillwind Yeti is a deceptively great card who can fit into many different decks. Why do you like or... gasp... dislike the Yeti? Let me know in the comments! All very true. The only problem that comes in is + spell damage, though that may be later in the game where it doesnt shine as well. Also, hunter can use Kill Command for only 3 mana if a beast is left on the board, or if they play a 1 cost beast like starving buzzard or Timber Wolf or Stonetusk Boar, leaving them with a board advantage as well, though not much. A naked Timber Wolf is generally bad. Especially against Mage or Druid. Same for the boar, but at least it can get one damage in AND cost them 2 mana next turn to remove it, possibly.